Clinical History:A 59-year-old man with a history of melanoma presented with a 1.6-cm endobronchial mass. The mass was biopsied and diagnosed as metastatic melanoma, and he subsequently underwent mass debulking and systemic therapy with checkpoint blockade therapy. Eight months later, the patient complained of cough and shortness of breath. 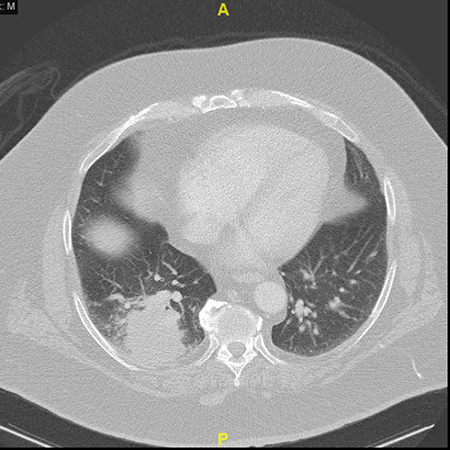 A CT chest was notable for a right lower lobe mass (5.6 cm; Figure 1), clinically suspected to represent progressive melanoma. The patient otherwise had no other systemic evidence of progressive metastatic melanoma, therefore the patient underwent resection of the lung mass (Figures 2-6). Q1. Based on the images provided, which of the following represents the most likely risk factor for developing this disease in this patient? Q3. True or false: No further speciation is required because knowledge of the mycobacterial species has no impact on therapy. Although the clinical impression in this case was recurrent metastatic melanoma, no malignancy was identified on resection. Instead, there was florid necrotizing granulomatous inflammation (Figures 3-4). The differential diagnosis included tuberculosis, atypical mycobacterial infection, and granulomatosis with polyangiitis. Initial stains for fungus (methenamine silver stain [MSS]), bacteria (gram), and mycobacteria (acid fast bacilli [AFB]) were negative. However, modified AFB (Figure 5) and immunohistochemistry (IHC) for mycobacteria (Figure 6) were positive and subsequent gene sequencing was positive for Mycobacterium avium complex. Since the patient was being treated with pembrolizumab, the pathologic findings were thought to represent reactivation of Mycobacterium avium complex secondary to immune checkpoint blockade. Reactivation of mycobacteria (including Mycobacterium tuberculosis and atypical species) has recently been described in the setting of immune checkpoint blockade. It is clinically important to speciate mycobacterial infections because it has implications for choice of therapy and infection control. Case reports have described this adverse event across multiple cancer types (melanoma, non-small cell lung carcinoma, others) and with different agents (pembrolizumab, nivolumab, atezolizumab). Although one may expect that inhibition of the PD-1/PD-L1 complex would improve control of mycobacterial infection, it instead leads to unrestrained T-cell effector responses. This has been demonstrated in a mouse model, with PD-1 knockout mice infected with M. tuberculosis succumbing to disease faster and displaying more florid necrotizing granulomatous inflammation as compared to wildtype mice. Other pulmonary manifestations of immunotherapy have also been described, including pneumonitis and sarcoid-like granulomatosis. The radiologic features of pneumonitis may take on various patterns, including ARDS-like with bilateral ground-glass opacities, effusions, and traction bronchiectasis, and NSIP-like with reticular opacities predominantly in the lower lobes. Though these patients rarely undergo biopsy, pathologists may occasionally receive biopsies from these patients in order to rule out infection. Patients with sarcoid-like granulomatosis often present with nodular opacities on imaging, with biopsies demonstrating interstitial and peri-airway non-necrotizing granulomatous inflammation. Upon cessation of immunotherapy, pulmonary findings typically either decrease or resolve on follow-up imaging. Our case also highlights the value of mycobacterial IHC, as although a traditional AFB stain was negative, mycobacterial IHC and modified AFB stains were positive. Multiple studies have demonstrated that IHC for mycobacteria is more sensitive than AFB. Furthermore, because IHC positivity can be identified at low power (due to bright signal, “leaking” of antigen increasing the size of the organisms, and increased number of organisms stained), ease of diagnosis is increased compared to AFB. However, mycobacterial IHC does cross-react with some other species, such as Nocardia and Candida, so it is important to recognize this important pitfall. When examining a lung specimen for abnormal clinical and radiographic findings in a patient receiving immunotherapy, consider pulmonary manifestations of immune checkpoint blockade (mycobacterial infection, pneumonitis, sarcoid-like granulomatosis) in addition to recurrence of malignancy. Barber DL, Mayer-Barber KD, Feng CG, et al. CD4 T cells promote rather than control tuberculosis in the absence of PD-1-mediated inhibition. Journal Immunol 2010;186:1598-607. Nishino M, Sholl LM, Awad MM, et al. Sarcoid-like granulomatosis of the lung related to immune-checkpoint inhibitors: distinct clinical and imaging features of a unique immune-related adverse event. Cancer Immunol Res 2018;6:630-5. Nishino M, Sholl LM, Hatabu H, et al. Anti-PD-1-related pneumonitis during cancer immunotherapy. N Engl J Med 2015;373:288-90. Picchi H, Mateus C, Chouaid C, et al. Infectious complications associated with the use of immune checkpoint inhibitors in oncology: reactivation of tuberculosis after anti PD-1 treatment. Clin Microbiol Infect 2018;24:216-8. Solomon IH, Johncilla ME, Hornick JL, et al. The utility of immunohistochemistry in mycobacterial infection. Am J Surg Pathol 2017;41:1364-70.